In the last recipe, I had talked about making masala popcorn. This weekend, I have been craving for snacks that I used to eat in India. So I decided to make another of my favorite snacks. 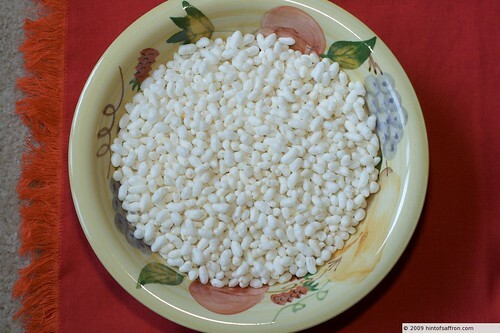 It is very easy to make and is made with puffed rice. The Indian name for it is Murmura. 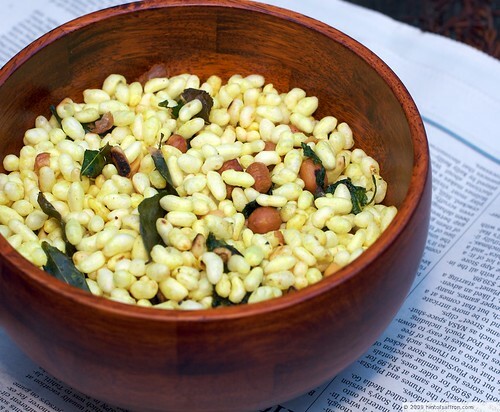 Puffed rice by itself is bland but when combined with various spices and peanuts, transforms it into a tasty snack. Puffed rice is a form of rice in which the rice grains are expanded to a volume that is several times larger than their original size. In Indian cooking there are various other dishes that are made with puffed rice – chaat (spicy melange of various vegetables and spices), sweets (puffed rice dessert made with Jaggery or sugar and ghee) and various other dishes. Another important ingredient for this recipe is good quality peanuts. 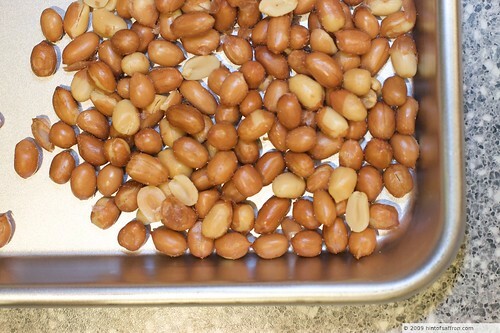 The roasted and salted Spanish peanuts that they sell at PCC Natural Market in Seattle, Washington is my favorite. Puffed rice by itself is plain and bland. It has to be combined with spices to make it into a mouth watering snack. 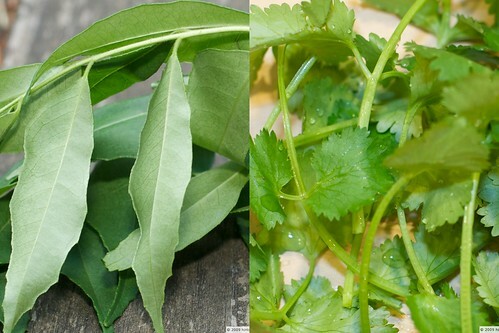 Curry leaves (available in any Indian grocery store), cilantro and serrano chilis round out the recipe. Here is how the final recipe looks like. It is not only healthy but very tasty. This is very easy and quick recipe. Use it as a snack anytime in lieu of popcorn or chips. I promise you, once you start eating, you will not stop! Heat oil in a medium wok or pan (3 1/2 quart) on medium-high heat. Just as the oil begins to smoke, add the mustard seeds (have a lid or splatter screen handy as they splatter all over) and reduce the heat to medium. Once the popping subsides, add the chilies and fry till they brown slightly. Then add the curry leaves and fry for another 30 seconds or so till they are light brown. Add cilantro, turmeric, salt and peanuts and stir fry for 10 seconds. Shut off the stove and move the pan or wok away from the heat. Add the puffed rice and stir well until all the puffed rice turns yellow in color.